Benchmarking of a demonstration handset at the Samsung Galaxy S9 launch event by Anandtech shows the Exynos 9810 to be a fast chip, but not as fast as the A10 and A11. Across the battery of tests, Samsung's newest processor, unveiled in January, does outperform its predecessor, but Apple's chips continued to dominate in most of the results. An initial GeekBench 4 single core test recorded integer and floating point scores of 3,734 and 3,440 respectively for the Exynos 9810, but by comparison the A11 scored 4,630 and 3,958 respectively. 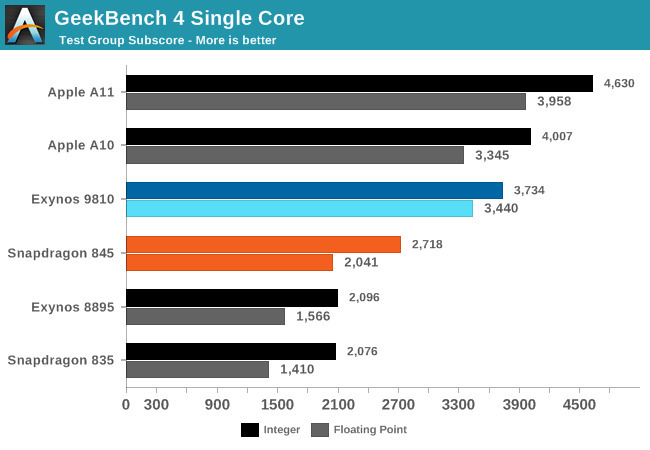 The A10 also beats Samsung's chip for the Integer score, achieving 4,007, but is just 95 points behind for floating point performance at 3,345. There is no change in position between the three chips when breaking down the scores to a per-megahertz level, as comparing the integer scores reveal the Exynos 9810 scoring 1.38 per megahertz, while the A10 scores 1.71 per megahertz, rising to 1.94 for the A11. For the floating point score, it's the sames story, with the 9810 getting 1.27 points per megahertz compared to the 1.43 points of the A10 and 1.66 of the A11. Using different benchmarks for the phones themselves instead of narrowing down to the processor, the results stayed fairly similar with the iPhone 8 and iPhone X beating the Galaxy S9 Plus. Using WebXPRT 2015, the iPhone X and iPhone 8 score 352 and 349 respectively, almost double the 178 points achieved by the Galaxy S9 Plus. Under Speedometer 2.0, the gap between the devices extends, as the Galaxy S9 Plus scored just 26.70 in the benchmark compared to the 88.90 of the iPhone 8 and 87.20 of the iPhone X. 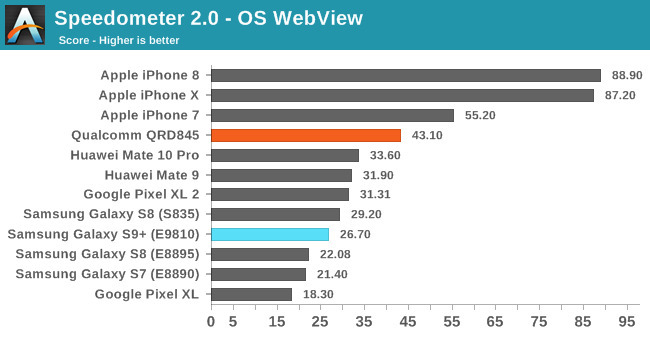 In both of these tests, the iPhone 7 also manages to best the Galaxy S9 Plus, achieving 199 under WebXPRT 2015 and 55.20 under Speedometer 2.0. Andrei Frumusanu of Anandtech believes there may have been an issue with the device being tested, as it was "barely able to distinguish itself from last year's Exynos 8895." While noting the larger cores were reaching their maximum set clock speed, Frumusanu suggests it could be issues with the scheduler and the DVFS configuration that's causing the handset on show to underperform. A Samsung spokesperson did confirm that the demonstration units were running special firmware for Mobile World Congress, adding that it may not be optimized to the hardware as of yet. Frumusanu considers it hard to believe Samsung would limit the performance for their flagship smartphones for the show, nor that the company would alter its scheduler settings for the occasion. Another notable element is that Samsung has clocked the four performance cores used in the Galaxy S9's processor at 2.7 gigahertz, down from the maximum 2.9 gigahertz claimed at the launch of the chip. Testing the Mali G72MP18 GPU included in the Galaxy S9 Plus revealed the same story, with its score of 45.70 peak frames per second on GFXBench Manhattan 3.1 beaten by the iPhone 8's 60.34 and the iPhone X's 64.19. Not much change was seen under the GFXBench T-Rex 2.7 test, with the Galaxy S9 Plus peaking at 143.4 frames per second while the iPhone 8 and iPhone X got 171.4 and 176.6 peak framerates. 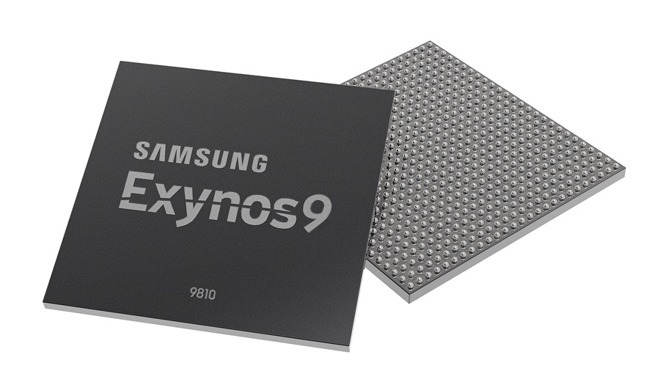 At the time of its launch, Samsung promoted the Exynos 9810 as using a 10-nanometer process, with an improved architecture that was claimed to double the single-core performance of its predecessor, while increasing multi-core performance by around 40 percent. Samsung also boasted of its "neural network-based deep learning" capabilities which can help with image processing, a feature similar to the "Neural Engine" used in Apple's A11 Bionic processor.